I am pleased to announce that my third novel, The Twiller, won the 2011 Red Adept Reviews Award in the science fiction category! As one of only three sci-fi novels to earn the honor, I am especially grateful. Check out the post and the other winners here. Astute readers may remember when I received a 4.75-star review of The Twiller from Red Adept Reviews back in May. Ian Harebungler, our hapless hero, just can’t catch a break. First, the deli ran out of his favorite cucumber sandwiches. Then he left the gas on at home. But the lowlight was being abducted from his front yard by a particularly ill-mannered alien, one who apparently doesn’t believe in anesthetic, no less. Fortunately, Ian is saved by an unlikely ally: the Twiller, whose bravery is somewhat overshadowed by its uncanny resemblance to a floating yellow marshmallow with big eyes. The Twiller follows the adventures of Ian and his newfound companion as they are whisked around the Universe, and Ian learns how difficult it can be to find his way home to a backwater planet called “Earth.” Along the way, Ian must survive the traffic of El Leigh, the enthusiastic protestors of Bez Erkeley, and rampaging politicians in the city of WMD. Even worse, he must contend with exorbitant prices in the city of York, endure the heat and crazy drivers in Fleur Ida, and struggle to escape the small planet of “Huh? Why E?” before he contracts island fever. Astute readers might pick up on subtle correlations to real places here on Earth, but my lawyers have reminded me to state that such resemblances are purely coincidental. You can find more info about The Twiller, including reviews and excerpts, on my website here. You can also purchase it from Amazon or directly from me through PayPal (in e-book or paperback format). At just $2.99 for the e-book, that’s less than your favorite blended coffee drink, and way better for you to boot! I am pleased to announce that the well-known book review site Red Adept Reviews posted a review of my third novel, The Twiller, today. I submitted The Twiller for submission back in June of last year, so you can see how well-respected Red Adept is by indie authors, and how inundated with submissions she is! A big thank you to Red Adept and her review staff — I’m glad you enjoyed the book! It’s funny, really funny. 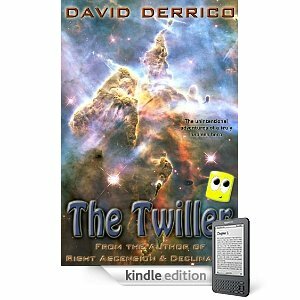 … Author David Derrico came very close to matching Douglas Adams’ farcical, achingly funny style of writing that fit the story so perfectly. … Overall, this was a fun book to read. Library e-book lending has several advantages — and several disadvantages — over borrowing a book from a traditional library. On the plus side, you don’t have to physically visit the library to browse or check out a book (although some publishers are pushing for this restriction!). Similarly, you don’t have to return the book — it will simply disappear from your e-reader when the lending period (usually 14 or 21 days) is over. Also, the e-book file you get will be pristine — no germs or markings or torn pages. Luckily, I am tech-savvy, so I tried the process out. Getting everything set up took an hour or so of fiddling around, downloading things, reading instructions, entering library card numbers, creating accounts, etc. Then I tried the two libraries I’m already a member of: my city library and the county library. At the city library (which is the nicest library I’ve ever been to), things weren’t so good online. They don’t use OverDrive, but instead use a service called NetLibrary. The first thing I noticed about NetLibrary is that they wanted me to read e-books on my LCD computer screen, instead of the far superior (for reading) and more portable e-Ink screen of my e-reader. A bad start. It turns out they had a handful of e-books available for download to an e-reader, but they all seemed to be computer programming manuals. Bottom line: I couldn’t find one single e-book available for download that I had any interest in reading. Next I tried my county library. Their website connected me to OverDrive, which seemed to have a better selection. However, as I searched for e-book after e-book, none of them were available. I finally found a few, but they were all in audiobook instead of e-book format. I eventually found a couple of titles that looked interesting, but all in all the selection was pretty desolate. Finally, I tried the library system of the next county over. They also used OverDrive, and had a larger selection than the first two (each library maintains its own collection of e-book titles through OverDrive, so even though they use the same system, the selection at each individual library may vary greatly). I actually found a few e-books I was interested in checking out. But only a few: maddeningly, many of the ones I wanted were still available only as audiobooks, and a few series I wanted to read were missing the early books but had later books in the series. In addition, due to restrictions placed on them by publishers, libraries can only loan each copy of an e-book they’ve purchased out to one person at a time. They have to wait until that copy is returned before lending it out again (they can, of course, purchase multiple copies). On the one hand, this restriction seems reasonable, although it simply copies the print book model when there’s no inherent reason to do so. (Why not allow unlimited check-outs, and just charge the library 50 cents per loan, for example? Or allow X loans per year but allow them to overlap?) In practice, this means that e-books you want to read may already be checked out, and you can be added to a waiting list and be notified when it’s your turn. All in all, library e-book lending isn’t anything like the “free e-books forever” ideal many people might have in their head when thinking about the feature. It’s cumbersome to set up and use, and the selection (both due to books that are checked out and a limited selection of titles) is underwhelming. But it does work, and is another way to get free content onto your e-reader. My advice: check out the e-book selection at your local library (or any other library you can join; some will allow out-of-area residents to join for a fee) to see if they have books you’re interested in before buying an e-reader based on its ability to read library e-books. 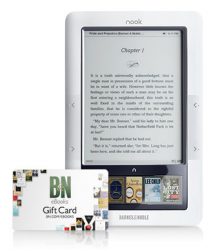 I recently purchased a Kobo Wireless E-Reader, as a backup to my Kindle 3. The Kobo has more limited functionality than the Kindle, but its light weight and low price somewhat make up for the lack of features. In fact, the Kobo’s strict focus on reading — without Internet access or the ability to play games or apps, for example — might appeal to some people, as might its simple interface (a power button, 4 side buttons, and a 5-way joystick). The Kobo Wireless is Kobo’s second-generation e-reader, which boasts Wi-Fi connectivity (to shop the Kobo store directly from the device), a better screen, more speed, and a built-in dictionary over its predecessor. 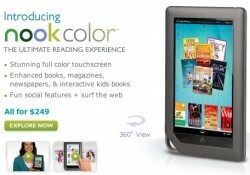 It retails for $139, the same price as the Kindle 3 Wi-Fi, but you can often find it discounted below that price. 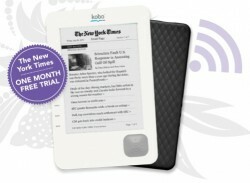 The Kobo Wireless comes in 3 colors (white front/silver back, white/lilac, and black/black). 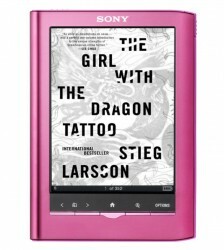 The first thing you notice is the light weight: at 7.8 ounces, it’s even lighter than the already-light Kindle 3 (8.5 ounces) or Sony Touch (7.93 ounces). It also has a textured (“quilted”), rubberized back that feels good in your hand. On the other hand, the front and 5-way joystick button feel a bit cheap, and the joystick can be a bit loud. 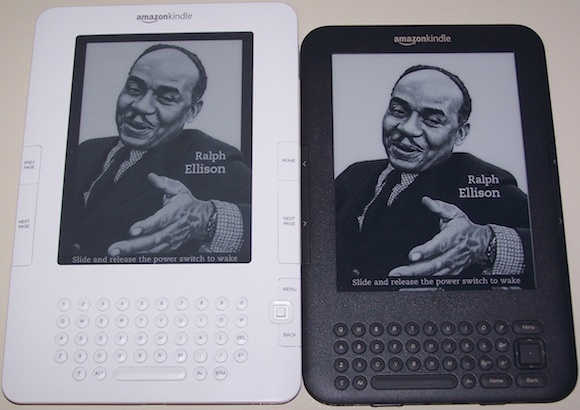 While it has the same size 6″ e-Ink screen as the Kindle, it lacks the newer e-Ink Pearl screen (which provides darker blacks and 50% more contrast) of the Kindle 3 and newer Sony e-readers. However, it is still quite readable, and you can see the difference for yourself in the photo above. 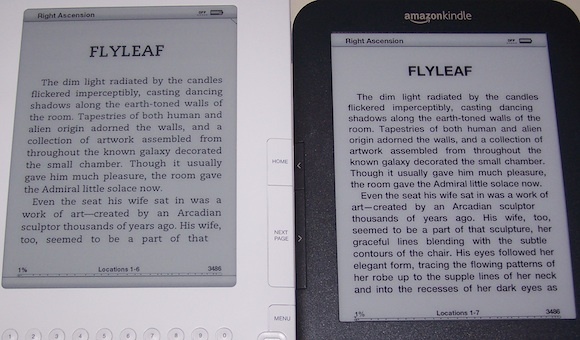 To be honest, the Kindle 3’s bolder font accounts for about half the difference. In fact, I found the Kobo to be a quite decent e-reader … but it repeatedly fell short when compared to my experiences with the superior Kindle 3. I think if I wasn’t already used to (spoiled by?) 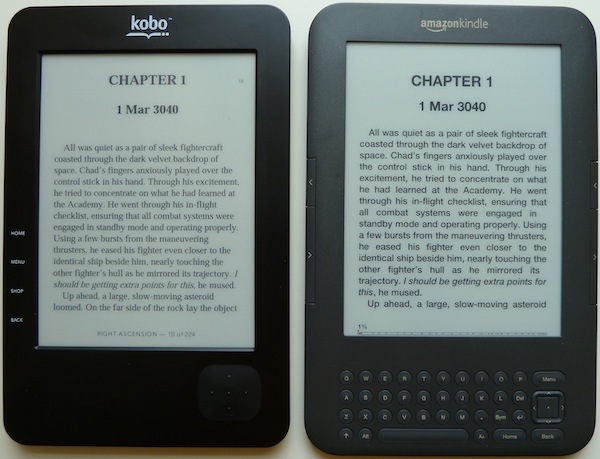 a Kindle 3, I would have a more favorable impression of the Kobo. Although I haven’t tried the process yet, I also like the option to access library e-books on the Kobo. Kobo (like Amazon and B&N) has software for PCs, Macs, iOS devices, Android, etc., which allows you to read your Kobo e-books on multiple devices. Another nice touch is that the Kobo comes pre-loaded with 100 classic, public domain (free) e-books. While you can find and download these yourself to read on any e-reader, the fact they come pre-loaded makes things simpler and lets people start reading right away. A few things are different from the Kindle: the most obvious is that you can buy books from the Kobo e-book store instead of the Kindle store. While the Kindle store is #1, the Kobo store has good availability and comparable prices, so I don’t see it as a huge weakness. Of course, you can also “side-load” books (using the included USB cable) that you’ve downloaded to your computer from Project Gutenberg, Smashwords, or numerous other sites. The Kobo lacks text-to-speech, Internet access, and the ability to run apps. While lacking these features is generally a negative, for some readers it won’t be an issue and might even be a selling point: the lack of distractions from reading could appeal to parents who want their kids to use an e-reader, but don’t want them playing games or surfing the Internet. The Kobo also lacks a full keyboard and many of the buttons of the Kindle. This makes certain tasks (like entering a password to connect to a wireless network) cumbersome, as you have to navigate an on-screen keyboard with the 5-way joystick (think of entering your character’s name using an old video game controller). I also prefer the easy-press page turn buttons on either side of the Kindle to the louder, harder to press joystick used to turn pages on the Kobo; the low placement of the Kobo’s joystick makes it hard to read one-handed, even with the light weight. On the plus side, there is less clutter, and navigation is pretty straightforward with the more limited selection of buttons. While the Kobo only comes with 1 GB of internal memory (compared to the 4 GB of the Kindle 3), it does have an SD card slot, which is a nice feature. 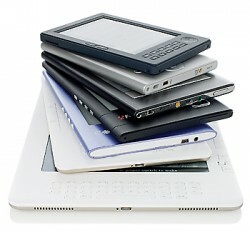 You should have plenty of room to hold hundreds or even thousands of e-books on either device. There were a few definite negatives about the Kobo (especially when compared to the Kindle): the Kobo is slower, and takes some time to turn on (about 29 seconds when I timed it). Not an outlandish amount of time, but it is annoying since the Kobo’s battery seems to drain relatively quickly when asleep (lasting about a week, even if not used), and performs much better when turned off completely. By comparison, Amazon recommends you leave the Kindle in sleep mode most of the time (the battery drain doesn’t seem to be as bad), and the Kindle wakes from sleep mode almost instantly. The Kobo is also slower when opening books (you get a loading screen, which only takes a few seconds, but the Kindle is nearly instant), changing pages (again, not a HUGE delay, maybe about a second, but slower than the Kindle 3), and loading new books onto the device (the Kobo spends about 10–15 seconds per book “processing” them, which adds up if you load several books at once). Again, nothing deal-breaking, just noticeably slower when compared to the Kindle 3. The Kobo also lacks the ability to play MP3 audio files (including audiobooks), does not have text-to-speech, and doesn’t let you bookmark, highlight, or take notes within e-books. Since I don’t use these features much, it’s not a deal-breaker for me, but they are limitations to be aware of. It’s also a little harder to get around e-books in the Kobo; while the 1.9 software update adds the ability to jump to a specific location, the lack of keyboard makes the process cumbersome. One definite negative is that, while the Kobo Wireless adds a built-in dictionary (that the older Kobo Reader lacked), it only works with e-books purchased from Kobo, not books side-loaded from the computer. For me, the dictionary is a must-have e-reader feature, one that I end up using far more than I first expected because it’s so convenient. Since most of my books are side-loaded from various sources (I haven’t bought any directly from Kobo yet), it means there’s no dictionary a good chunk of the time. Even where it does exist (like on the pre-loaded books), the process is slower and more cumbersome than the Kindle: press menu, select “Dictionary,” press the joystick, choose the word, press the joystick, wait a few seconds, and a definition pops up (covering most of the screen). Like on the Barnes & Noble Nook, this multi-step dictionary implementation pales in comparison to the Kindle, where you simply select the word and a short definition pops up at the bottom of the screen (you can press “enter” to see a longer definition if you want). Another odd quirk: on side-loaded e-books, you’ll see small page numbers in the right-hand margin, and these numbers can intrude into the text area (causing nearby text to dim). Not a huge deal, but a minor annoyance that nonetheless was noticeable and jarred me from becoming engrossed in a book a couple of times. The battery life is listed as 10 days, very good compared to most electronic devices, but inferior to the Kindle 3’s claim of 1 month on a single charge. All in all, the Kobo Wireless makes a decent enough e-reader. If you’re looking for light weight, limited features (if you don’t need Internet access or consider the lack of it and focus on just reading as a positive), and the ability to read library e-books, the Kobo makes a decent choice. 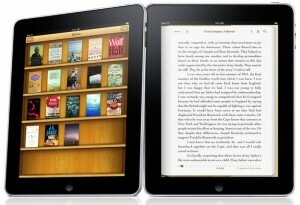 It does have some nice features, like the light weight, pre-loaded books, and book covers as screen savers. It seems to generally work pretty well for just plain reading, which is the #1 priority. Unfortunately, it falls short when compared to the speed, features, and e-Ink Pearl screen of the Kindle 3, and Kindle owners may find it disappointing in comparison. 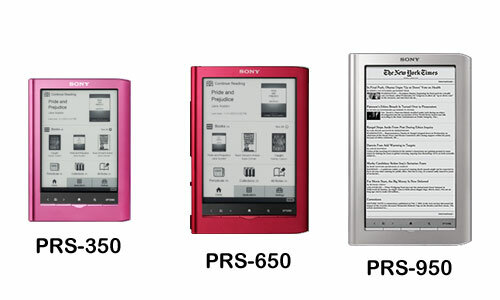 The Kobo Wireless does compare pretty well to the Nook (the Kobo has similar speed and lighter weight) and Sony E-Readers (the Kobo has Wi-Fi and a much lower price), when looking at other e-readers capable of reading ePub library e-books. My overall conclusion is that, for the same $139 price, the Kindle 3 Wi-Fi is a clearly superior e-reader for most people. However, the Kobo Wireless can make a compelling low-cost alternative (as when the original Kobo was first introduced and the Kindle 2 was still $259): since the Kobo Wireless can sometimes be found on sale (or on clearance at a closing Borders store), it can be a good buy as a second e-reader or low-cost alternative if you find a good deal (under $99). Somewhat of an off-topic post here, as I discuss some of my favorite and least favorite things money can buy. I started out wanting to give a shout-out to those products and companies that provide a great product or service, the things that just do what they’re supposed to do, do it reliably, and do it well. Then I figured it would also be a good excuse to rant a bit about those things that just annoy the heck out of you. Mac Mini: I’ve been a Mac user for many years, and I find their computers far more reliable, easy to use, and virus free than the alternatives. (Note I do not necessarily feel the same way about all Apple products and iDevices, I’m talking about Mac computers specifically.) Nowadays, even low-end computers are fast enough for 95%+ of consumers; unless you’re doing high-end video editing work or playing the latest games, even the $599 Mac Mini is enough for email, Internet, Photoshop, word processing, etc. And, at that price, I get a new one (with the latest operating system and Apple iLife software) every few years. Mine never crashes, takes less than 30 seconds to start up, and does what I need it to do without spending hours constantly trying to fix it. Readability and Instapaper: I’ll combine these two must-have Internet services. Readability is a “bookmarklet,” a little piece of code you save as a browser bookmark and that takes annoyingly-formatted articles that are split into 4 pages (I’m looking at you, Gatorsports.com) and formats them into a single, easy-to-read, black-text-on-white page, removing annoying side columns and flashing ads. Instapaper does something similar, gleaning the text of an online article and saving it into an archive for you to read later (or transfer to your Kindle). Kindle 3: Regular readers of this blog knew this would be on the list (to be honest, it’s what prompted the idea for this blog post). The more I use the Kindle 3, the more I like it — actually, can’t live without it. It’s light and easy to carry and use, and the new e-Ink Pearl screen is very easy on the eyes, far better than the Kindle 2’s screen. The additional software improvements (like fitting more text on a page) are the icing on the cake. As a fiction reading device, it has no equal. Corvette Z06: Ten years ago, when I was working as a lawyer at a big law firm, I splurged and bought my first new car, a 2001 Corvette Z06. I’m still driving it today, and it’s as fun to drive now as the day I bought it. This car is a precision-crafted machine that was built for a specific purpose and truly excels at that purpose. For under $50K (at the time), it blows away cars that cost double and triple the price. It’s also surprisingly practical, handling two cross-country trips with luggage, getting 28 mpg on the highway, and it hasn’t had any mechanical issues to speak of. Yes, tires are pricey, but well worth it for how this car accelerates, brakes, and handles. One note: if you’re looking for a chick magnet, look elsewhere — girls seem to be more impressed by cars that cost more but sport a fraction of the performance (*cough* Porsche Boxster *cough*), and it mainly impresses 18-year-old guys (who can actually tell a Z06 from a regular Corvette). But that doesn’t bother me, I bought it to drive, not impress, and I’ve never been disappointed. Net 10 Wireless: Sure, it’s not “cool,” but I only pay $15 a month for my cellphone, which is less than most people pay just for their texting surcharge. Yeah, I only get 200 minutes (I don’t talk on the phone that much, and they roll over), and I can’t play Angry Birds (boo hoo), but I get great reception, never drop a call, and the battery on my non-smartphone lasts a week while my friends’ phones can’t make it through a day. ING Direct: Very simple, convenient, no-fee, high-interest-paying online checking and savings accounts. It does exactly what it’s supposed to, pays a good rate, and makes it very easy to automate payments and transfers and handle my banking online. Honorable Mention: Costco, for cheap prices, $1.50 hot dog & drink meals, and a very generous return policy. CreateSpace, for simple and affordable print book publishing. Airlines in general, and American Airlines in particular: Airlines have just gotten so bad at customer service it’s a sad joke. I remember when it was kinda fun to fly, people treated you well, and they gave you playing cards and little wings — and I’m not that old. Now, you’re herded like cattle, charged for baggage (so everyone tries to cram all their stuff aboard), not fed, and squeezed into rows that I swear they make 1 cm smaller every year, figuring we won’t notice. But that’s the only explanation, since I stopped growing a while ago. They’re all pretty bad, but a special shout-out to American, who not only doesn’t have Wi-Fi or LCD screens on the seatbacks, they still have CRT TVs hanging down, like it’s 1972. And not only do they not feed you, but I was just on an 8-hour American flight and they didn’t so much as give us peanuts. On the plus side, most of my flights lately have been on time. And Hawaiian is the best of the bad domestic airlines. iTunes: As much as I love my Mac, iTunes is the single biggest abomination of software I’ve ever seen (and I’ve used Microsoft Word, so that’s really saying something). First of all, who decided I wanted one program to manage my music library, organize e-books, watch movies, sync apps and music and movies and everything else with iPods and iPads, perform endless app and iOS updates, and be the only conduit to the App Store and iTunes Music Store? And does iTunes really have to launch (which takes way too long, now that it’s 10 programs in 1) every time I click a link to read about some app in my web browser? Oh, and syncing never seems to work right, every movie is in the wrong format and half my songs aren’t authorized for this iPod or whatever. The latest sync froze the movie player on my wife’s iPad for her 10-hour plane trip. Ugh. AT&T Wireless: I don’t even have AT&T, but their cell phone service is so bad, I know which of my friends has it by how often they drop calls when I talk to them. Well, sure, they have the worst service, but at least they’re by far the most expensive wireless carrier. Wait, what? Oh yeah, that iPhone (with 2-year AT&T contract) didn’t only cost you $200. Car Dealerships: OK, this is an oldie, but they’re breaking out some new tricks. Pretty much every dealer tries to slip in some sort of “dealer fee” or “dealer prep” or “ADM” (additional dealer markup) after you’ve negotiated the price of the car. And since people caught on to “rust coating,” now they have mandatory overpriced VIN etching in the windows (who needs that? ), and — are you sitting down for this one? — “Nitro fill,” which means, yes, they’re actually charging you $100 to put air in your tires. Dis-Honorable Mention: Red Lobster, because the commercials look so good and I get suckered into going back once every 10 years for some truly awful food — never again. Telephone Customer Service, outsourced to the lowest bidder and keeping you on hold for an hour, for just about every company ever. HSN & QVC, for ripping people off so badly; they should be ashamed. Cable companies, which is why I don’t have cable anymore. Movie theaters, who have the nerve to show commercials but expect me to pay $12-$15 for a movie. And commercials in general, isn’t it enough already? When we get back from a 5-minute commercial break just to see the announcer standing on a court with a Gatorade logo inside Staples Center which is plastered with Geico ads, and the announcer unconvincingly plugs the latest smartphone while telling us to watch the Allstate replay, brought to you by Coke — “obnoxious” doesn’t begin to cover it. As a follow-up to my 2010 Year In Review post, I thought I’d highlight a few of my favorite things (devices, developments, services, or books) from the past year. Regular followers of this blog are surely sick of hearing me sing the praises of my Kindle 3, so I’ll keep it brief, and point you to my Kindle 3 Review (with pics). But I will just mention that I’m liking it more and more the longer I use it, and I’m actually finding myself drawn to reading more than I was on my K2. I’ve read about a dozen books in the month or so that I’ve had it, and that’s probably the most important thing I can say about it. Speaking of those dozen books, most of them have been in the excellent Vorkosigan series by Louis McMaster Bujold, and available for free on the Baen Free Library as part of the Cryoburn CD. This science fiction series follows the exploits of Miles Vorkosigan, who is not your typical hero: he is physically short and weak due to stunted growth stemming from his mother being poisoned during pregnancy. He makes up for his physical failings with a mixture of wit, bravery, bravado, charisma, and reckless risk-taking. The books are more of the space opera, soft science-fiction style: there are a few cursory ship battles and discussion of technology and weaponry, but really quite little. Most of the action takes place man-to-man, whether on the ground (including the convoluted politics of Miles’ homeworld, where was born to an important noble family), on space stations or ships (where boarding parties and mercenary raids are common), or between negotiating diplomats from one of many human factions. The stories are well-crafted, the writing is excellent, and the adventures are entertaining, even if some parts strain credulity a tad — Miles does have a way of getting into and out of some incredible situations. Of note: the series consists of a sometimes-confusing timeline of 14 novels and 4 novellas, grouped into 7 omnibus editions. I recommend reading the books in chronological order, not necessarily the order in which they were written or arranged (the stories in omnibus edition #5, Miles, Mutants, and Microbes, are out of chronological order for the rest of the series). The second issue is that one pivotal novel, Memory, is not included in the omnibus editions. Now, I can’t complain much for getting 13/14 novels for free and paying $6 to Baen for the missing one (which I did), but it is confusing. Also confusing is why Baen would give away essentially an entire series for free. I could see the first book or two in order to drive sales of the rest of the series, but I fear that authors and publishers giving away too many books for free smacks of desperation, and will have a “tragedy of the commons” affect, where no one is able to sell e-books anymore, but that’s for another blog post. Early this year, prompted by Apple’s anticipated entry into the e-book game, Amazon announced that in July they would double royalties (from 35% to 70%) for e-books sold through their DTP self-publishing platform that (a) were priced between $2.99 and $9.99, and (b) enabled text-to-speech and met other requirements. This announcement gave many self-publishing authors real hope of making a living at their craft — selling enough e-books to make a living with a $2.05 royalty (about what most $2.99 e-books end up with after a small, size-based fee Amazon deducts) is much more likely than with a $0.35 royalty (35% of $0.99). It also has repercussions in the e-book pricing world and the publishing world — as authors suddenly wonder if sticking with traditional publishers (and their 8% print and 17.5% e-book royalties) is worth it. In April, I switched over my website (which I had maintained since 1998, mainly writing my own HTML and PHP) to the WordPress platform. WordPress is a free content management system primarily aimed at bloggers, and it allows for simple and modular blogging, website organization, and other features. The main impetus for the switch was my interest in blogging, and I used it to write 103 posts over the last 9 months of the year. While it takes some tinkering to get it to work right as a full website platform (supporting both a traditional website and the blogging section), it does make blogging much easier and provides a ton of useful features I couldn’t have done on my own. While I technically discovered KindleBoards.com in late 2009, I really became active on the site in early 2010, where I met lots of great authors and readers, learned a great deal, and got much more exposure for my books. The newfound avenue for reader-author interaction is invaluable, and I had many memorable discussions and enjoyed interacting with readers, especially on my book threads. The site is not only a great source for information, but is also the best-moderated forum I’ve ever used, and the users are generally truly cordial and helpful, even to newcomers (which is, sadly, quite rare on the Internet). As part of the research I do for this blog and for the business aspects of self-publishing, I follow over a dozen Kindle, e-book, technology, and publishing-related blogs. One of the most helpful I’ve found is the I Love My Kindle Blog, maintained by Amazon forum regular Bufo Calvin. It has a great mix of archived information about Kindle tips and tricks, and regular posts about new developments in the e-book and e-publishing worlds. Bufo is also very responsive, and is always happy to respond to comments or emails, and was even kind enough to post a review of The Twiller when it was released. A few days before my birthday, I got a pleasant surprise in the mail today: a new Kindle 3 from my wife. I own (and am quite happy with) a Kindle 2 already, but after reading and writing about the Kindle 3 for almost 5 months now, and seeing photos and being able to play with one at the local Target, I finally decided I wanted the upgrade — and I’m glad I did. I decided on the $189 graphite 3G + Wi-Fi Kindle 3 — while the $139 Wi-Fi-only version is a great deal, only $50 extra for 3G connectivity and free-for-life 3G wireless service was too good a value to pass up. For $50, I’d rather have it and not really need it than need it and not have it. The first thing that struck me is just how small, thin, and light it is. While my old Kindle 2 is hardly enormous or heavy — only 10.2 ounces — the Kindle 3 is smaller in every dimension and only weighs 8.7 ounces (about half a pound). It’s very easy to hold and read one-handed, especially since I haven’t gotten a case for it yet. The second thing I noticed is the new e-Ink Pearl screen, which promised increased contrast. It definitely delivers. Just check out the photo above: see how much darker the blacks are on the K3 compared to the K2? On the K3, I find the blacks to be noticeably darker (almost a true black), and the background to be slightly lighter (still not a true white, but a lighter shade of gray than on the K2). In combination, the text really pops off the page on the K3. While the K2’s contrast was fine by itself, when I look at it compared to the new K3, it seems a bit “muddied” in comparison. The text on the Kindle 3 is significantly darker than on the K2, and the background is lighter. The combination makes for a noticeable improvement in readability. Another nice improvement: notice how much more text you get on the K3 screen — an extra 5 lines of text. This is from a combination of the font being more condensed (but more readable), and the location bar being moved all the way down to the very bottom edge of the K3’s screen. Even better, once you click the next page button on the K3, the title bar (that shows the name of the book and the battery indicator) disappears, giving you more room at the top and bottom. Even with the same font type and size, the K3 will get several extra lines of text per page. In total, it seems like I’ll get 25-33% more words on the K3 screen, which is great for a few reasons: having to press the page turn button less frequently (which is nice in itself) also means I should be able to read faster, and the battery will last longer, since e-Ink screens only use power when you change pages (you should get about 10,000 page turns per battery charge, regardless of how many words are on each page). In other words: a book that used to take 1,000 page turns (and use 1/10th the battery life) might now only take 750 page turns (and 1/13th the battery life). A few other notes: the K3 has a few improvements I haven’t really noticed yet, including longer battery life (both will last for weeks), more storage space (I’m nowhere near filling up either one of them), and faster page turns. I did a side-by-side test, and the K3’s page turns are a little faster, but this is honestly a non-issue for me, as the K2 is plenty fast enough anyway — faster than turning a page in a physical book. Whether the K2 is 0.8 seconds and the K3 is 0.6 or whatever, they’re both fast enough that I don’t notice any delay. I played around a bit with the K3’s improved web browser (and Wi-Fi connectivity, which for some reason didn’t “see” my network, but once I entered the network name and password it connected with no problem), and it does seem to be much improved. Using the web browser on the K2 could be described as frustrating at best: you could do it, but only if you really had to. The K3 browser is still far from pleasant (compared to a computer or iPad), but it’s much faster, more usable, and seems to render more sites properly. It had no problem with my Yahoo portal, Yahoo mail, this blog, and Amazon’s DTP book sales reports … which I’m embarrassed to admit that I check way more often than I should. 😉 (Ironically, Amazon’s DTP page had problems loading properly on the K2.) The K3’s zooming and panning functions (a necessity due to the 6″ screen) worked pretty well, and the “article mode” (which strips out extraneous stuff and just presents the main text from some web pages) works great so far — this blog came up looking great in article mode. Of course, the Kindle’s e-Ink screen is 16-shade grayscale, and it doesn’t do video, so certain sites are just not going to look that great. And the speed is so-so over Wi-Fi; I think it’s slower over 3G but haven’t tested that yet. I do have to include a few early nitpicks: I miss the number keys (both have full keyboards, but the K3 loses the top row of number keys from the K2 — instead, you need to press ALT + the letters on the top row). I think this will turn out to be minor, since I hardly ever use the number keys normally, but I had to use them a few times in the initial set-up (mainly punching in location numbers to get to the right place in certain books). But it seems like they could have fit the number keys, or at least printed the corresponding numbers on or near the top row of letter keys. My second nitpick is that I hit a few buttons accidentally: the page turn buttons (which now depress toward the edge instead of the middle like on the K2) and the buttons near the new 5-way controller. I think the side button issue will go away once I get a case, and hopefully I’ll just adjust to the 5-way button and it won’t continue to be an issue. What else? I’ll have to read more on it (I just got it a few hours ago) to give you more detailed thoughts on the reading experience, and I’ll write a follow-up article in a couple weeks when I can give a more thorough review. But my early impressions are very favorable: the main reason I wanted the K3 was the improved screen contrast, and it delivered. I think the combination of better contrast, more words per page, and lighter weight are going to combine to make the reading experience — which I already found superior to a printed book with my K2 — even better.